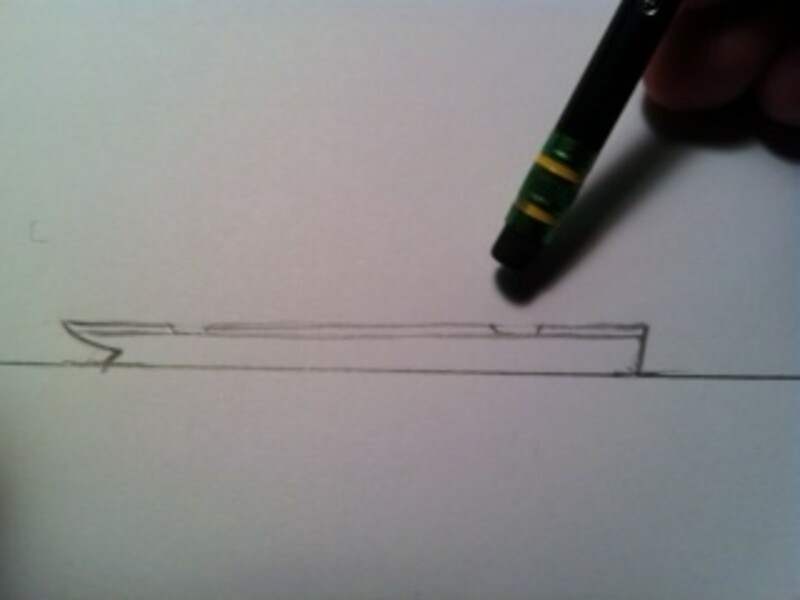 If you're trying to draw the famous Titanic, just follow this simple tutorial and you'll be a Titanic drawing master in no time at all. From a strictly engineering perspective, the Titanic was considered a ocean-going zeppelin. There was a horse aboard. A thoroughbred named Fleet Strudel. There are 143,619 books written about the Titanic, one written entirely in Morse code. After the collision with the huge iceberg, Titanic's No. 13 lifeboat was launched, struck a small piece of floating ice and sank. There were only 6 toilets on the whole ship. Most passengers followed the age-old method of simply going over the side of the ship. 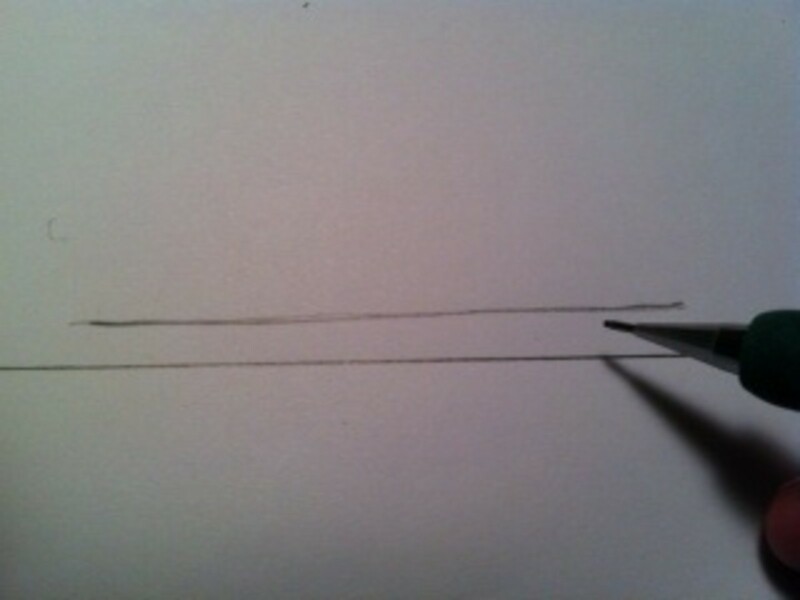 OK, so to begin, you want to draw two lines across the paper. These lines should be parallel to one another. The line on the bottom is the sea surface and the line on the top is the main deck of the Titanic. For this step, you're going to connect the two parallel lines. 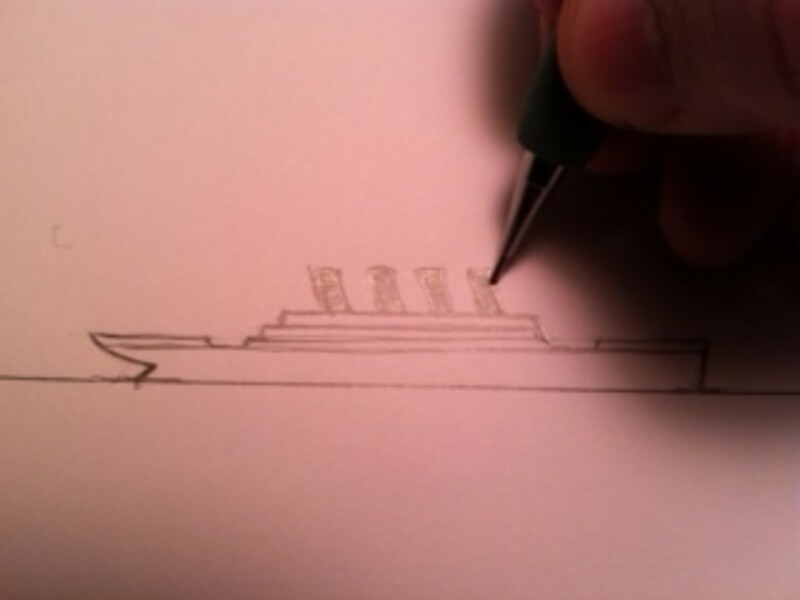 On the left, draw a sort of sideways checkmark to make the rear portion of the Titanic. In the James Cameron motion picture, this was the part of the ship that went down last. On the right side, simply draw a slightly curved line connecting the two parallel lines as indicated. This shot shows the line that indicates the bow section. You can see that it's just one, simple line that is ever so slightly curved. Just a hair under the top horizontal line, carefully draw another line that runs parallel to the top horizontal line as shown to the right. 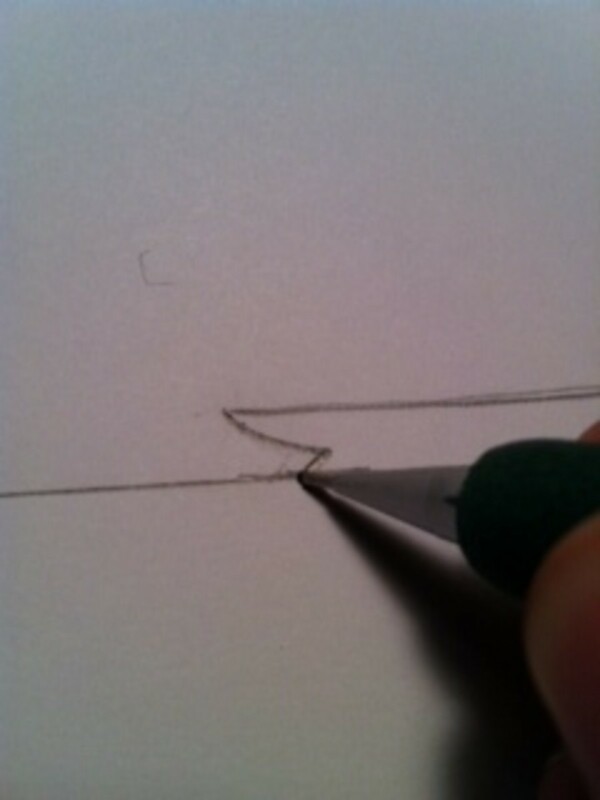 Using your eraser, remove a bit of this line. 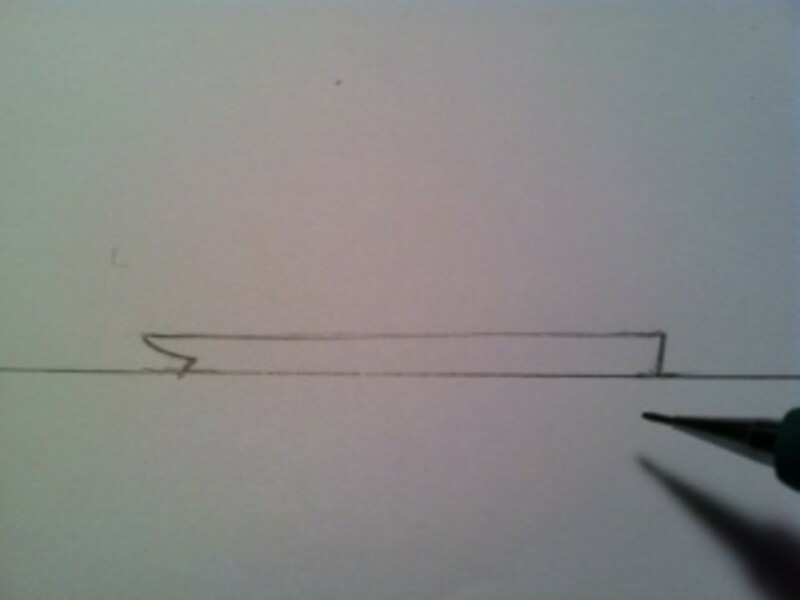 Make a small opening near the bow, and one near the stern as shown. 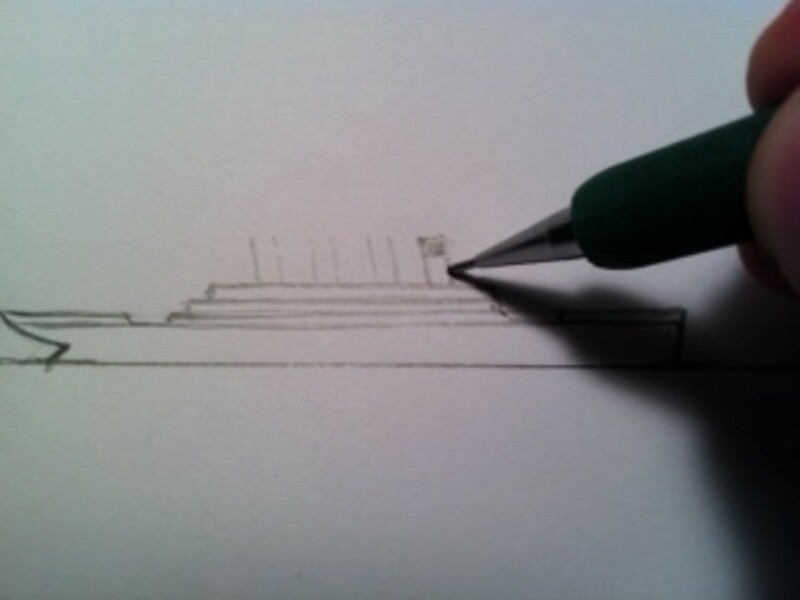 For this step, simply add a few more horizontal lines to indicate the superstructure. The superstructure is the part of the ship that appears above the deck. The Titanic has 4 large funnels or smoke stacks. Draw these as simple rectangles. Note that these are slightly tilted and lean toward the stern. Did you know the fourth stack was later added as a design feature - it has no real function. 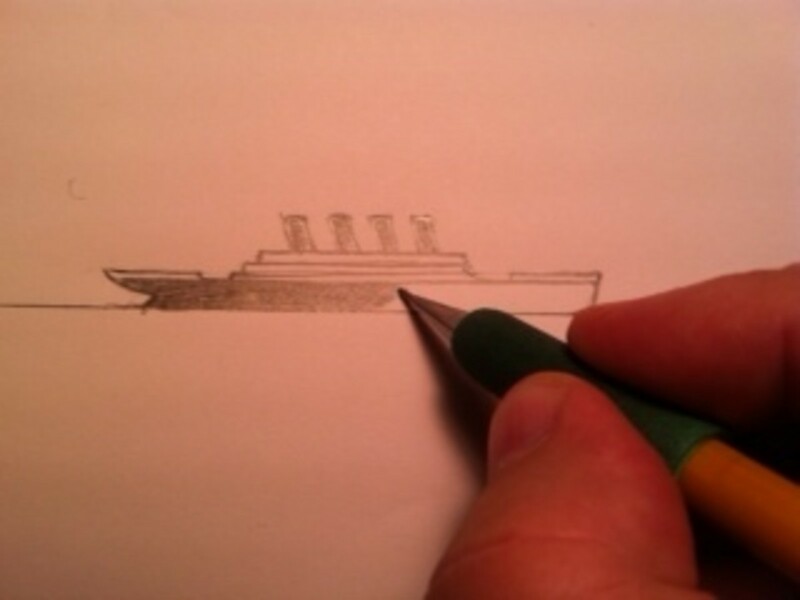 Your drawing should really be coming together at this point, really starting to look like the Titanic. In this step add the wide black ring at the top of each funnel and add shading to the lower areas of each funnel. 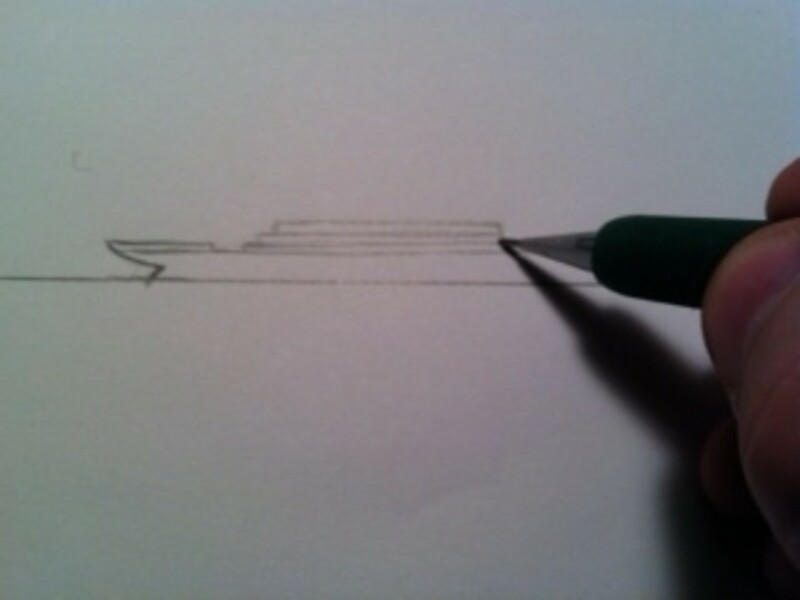 Press down a bit on your pencil and add some dark shading to the side of the ship. The Titanic was primarily black with a white ring around the top of the deck. The Titanic is actually classified as a schooner because she has two masts. The mast at the rear of the ship is the "mainmast." 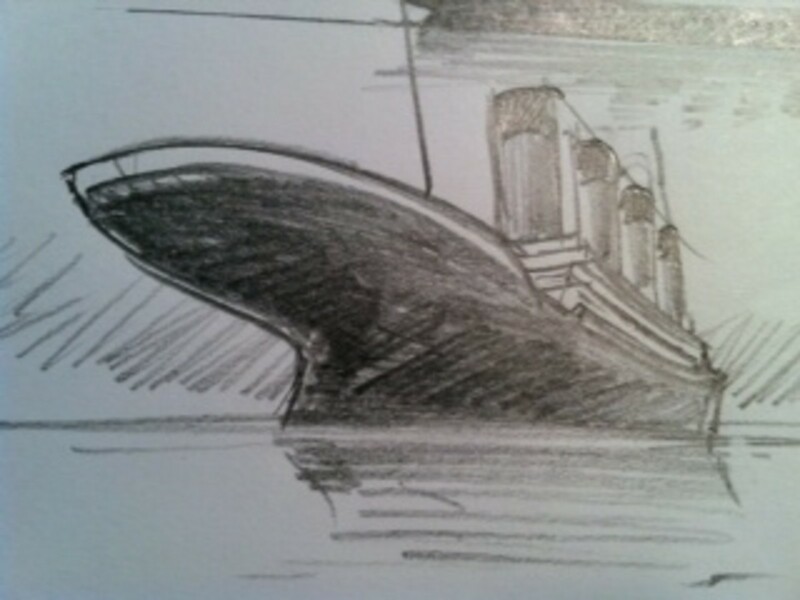 The mast on the front, or bow of the ship (right side of drawing) is the foremast. The "wireless" antenna was stretched between these two masts. For the final step, I have added some smoke billowing from the funnels, a few seagulls and a slight mirror reflection on the water's surface. The Titanic was truly a ship with beautiful lines. Here are some of the other angles I like to draw. 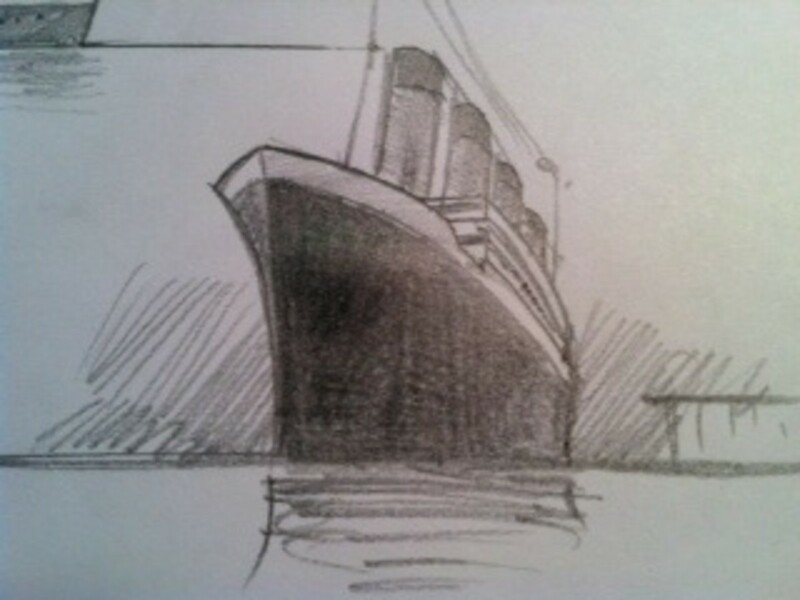 There's the rear shot and the front shot - both angles show Titanic's spectacular figure. That's it -Step back and take a look. 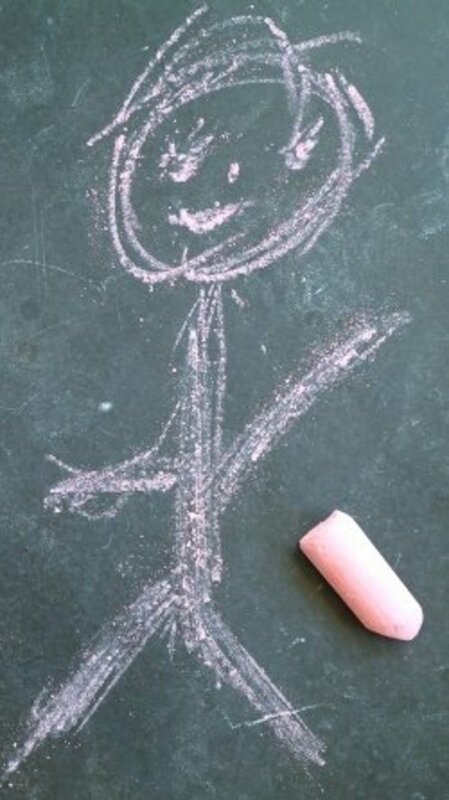 How does your drawing look? Remember, drawing is simply making a bunch of shapes that fit together in a certain way. Drawings like this do look complex at first but are basically simple. Its perfectly normal to get frustrated and draw something many times until you get it right. The fun of drawing is in the journey as well as the end result! Guess what? 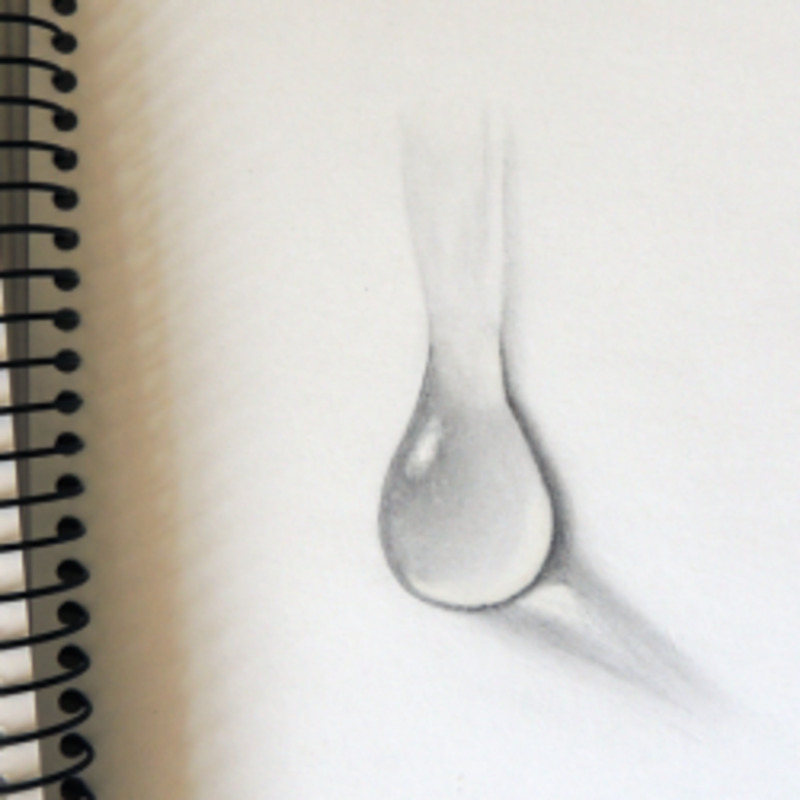 - the more you practice, the easier drawing becomes. I wish you the best with your drawing! 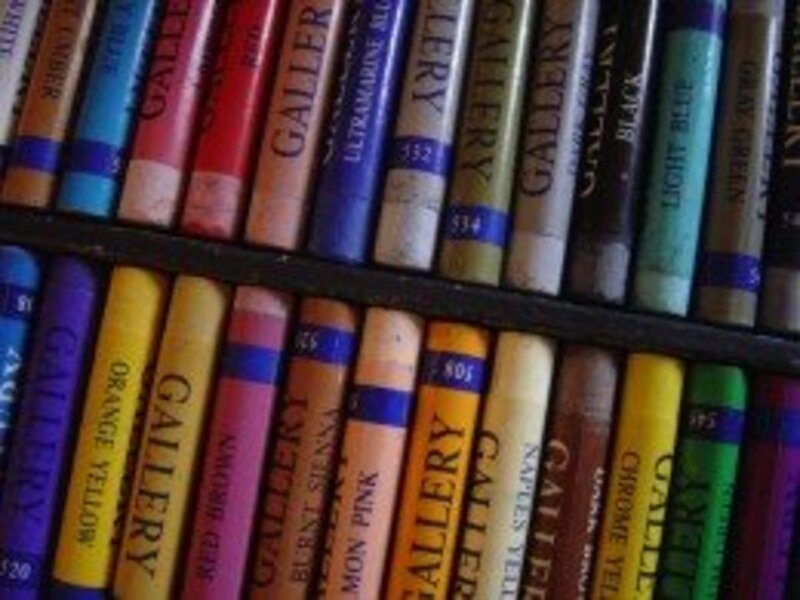 What is your favorite part about drawing? DDE and Dbro - Thanks for the read and kind comments! Great hub, MKayo! Your instructions are very concise and clear. 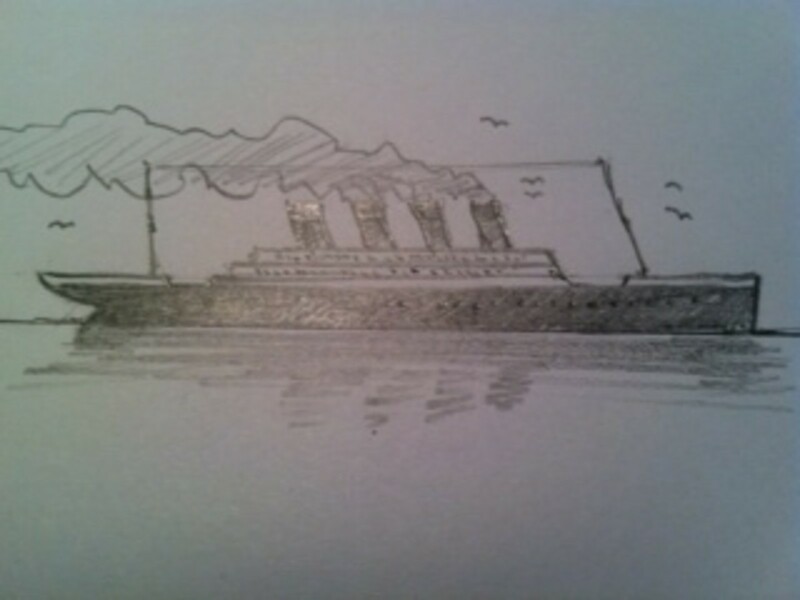 I think anyone who is interested in drawing the Titanic could do it if they follow your directions. I especially like your comments at the end of your article. "The fun of drawing is in the journey as well as the end result." How true that is. Thanks for this informative and inspiring hub! 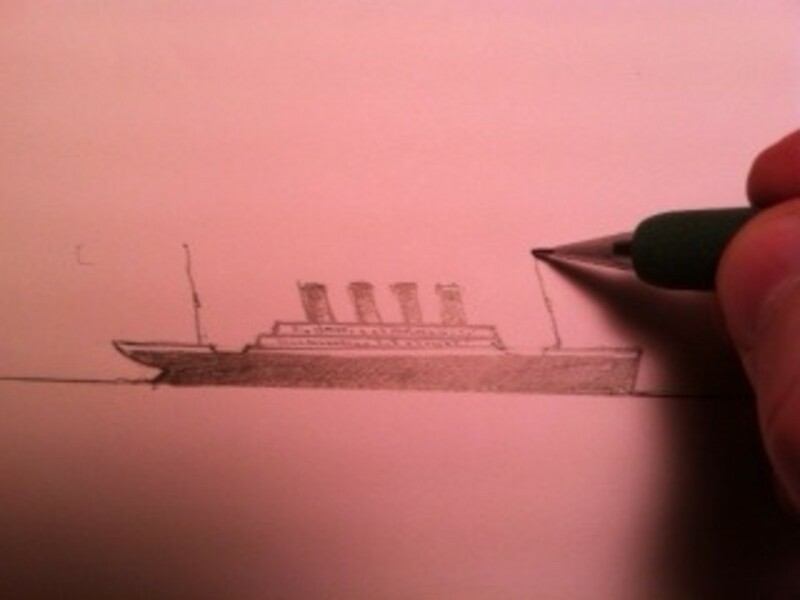 Very well approached with such simple steps one can take the time to draw the titanic.